Does anyone have experience in breeding adolfoi? If so I would love to hear from you. Thank you. My son asked "who was Elton John dad"? I replied "He played keyboards son, for Marc Bolan"! My group of 8 wild caught C.adolfoi spawned for the first time in my tank only 3 weeks after purchasing them. In those 3 weeks, I provided lots of nutritous and varied food (frozen) such as red mosq. larvae, freezedried tubifex, sinking Hikari Cory food tablets, frozen brine shrimps and so on. JBL Krill flake food now and then as well. Tried to not give the same food two days in a row for variety. The tank is not very bright lighted, only one light tube of that kind you use for plants (kind of pinkish light in them). They seem to feel safest when the light is not to bright. Roots for cover, and a lot of fast growing plants. Sand at the bottom as substrate. I usually changed 10% of the water each or every second day, and kept the ph at 6.7. The hardness isn't much to talk about in my tap water, kH is 1 and gH is 1 or 2. Very soft in other words. I have raised some of the fry, and currently I have about 20 about 5 and 6 months old. I stopped picking out the eggs before the summer started, since vacation was coming up. The adults usually eat the eggs stuck on the glass, but the ones in the java moss they seem to leave alone. But remember to change the water a day before hatching! The water gets very acid with the peat, and it's best to change it before hatching since it's much more difficult to make any changes at all AFTER the fry has emerged. They can die even if the temperature changes as little as 2 celsius degrees... Very sensitive fry in other woords. I picked out 11 eggs, 9 of them hatched, and all 9 are now happily swimming around in one of my tanks. They are 6 months now. First of all welcome to the SC forums and I hope you enjoy your stay here. Well done on the adolfoi breeding and the great write up. I've not bred them myself but I am aware that they are pretty slow growing. 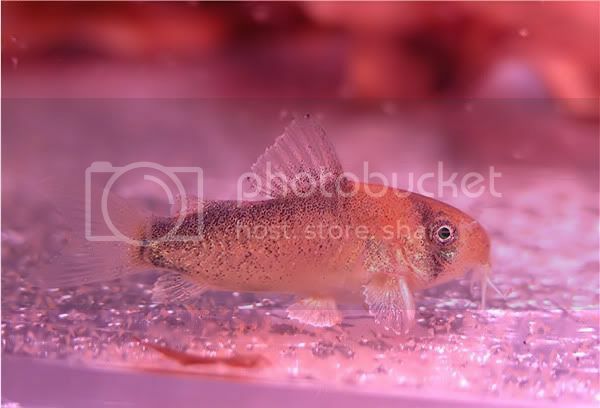 I have plenty of photos, from all stages of the Corydoras adolfoi fry development. This photo is taken when they were 5 weeks old. The first of these two photos (on the left) shows a one day old fry, with yolk sac. The second photo shows a five day old fry with a belly full of newly hatched brine shrimp. I am in the middle of producing your article but the more I look at your adults I am more than sure that it is C.duplicareus that you have instead of adolfoi. The main difference is the black band over the top of the body. In adolfoi it is very slim and duplicareus is quite a bit broader. "The black pigment on the back of the body is broad in some specimens, narrow in others." 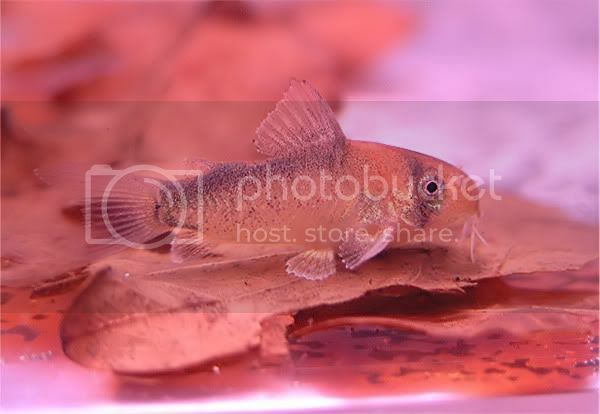 The fish on the picture is about 6 months, maybe younger (I have several ages). The main difference is the black band over the top of the body. In adolfoi it is very slim and duplicareus is quite a bit broader. Well, what ever they are , C adolfoi or C duplicareus (or maybe a natural mix of both, they are wild caught after all?) I've now started up breeding them again after a long summer rest. I have two groups of fry from eggs laid and hatched in august, and they are growing steady on a diet of newly hatched BS. It's soon time to start feeding them other kinds of food, but earlier experience shows that they can be a bit slow and unwilling to accept prepeared foods. The adult spawning group of 5 made a new spawning record recently and spawned 3 times in one week (last weekend), but I lost the two first batches. But the third time they spawned I collected eggs again, and they are now starting to hatch. The photos below shows one of the fry that hatched 15 th of august, and it's 5 and a half weeks old on the photos. The bb tank has no other decorations or sand, just the oak leaves.